Crows teach each other who's who. As you know, I'm very interested in crows as pets, especially Bertram, Corvina, and their babies. 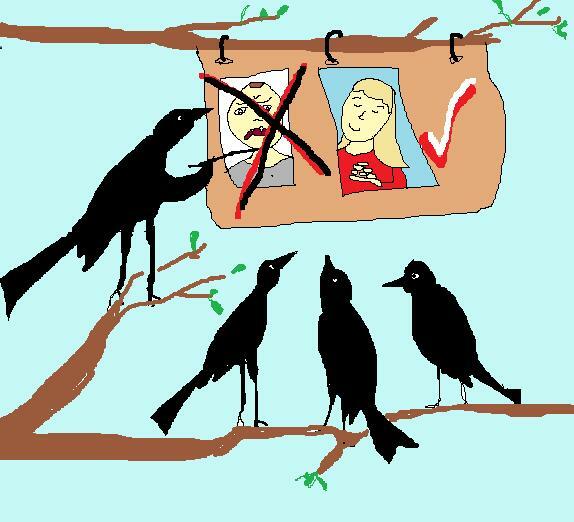 Scientific researchers, too, have become very interested in crows, mainly because of their extremely high intelligence and the similarity of their social behavior to that of humans. My friend Biker Bob just pointed out this article about crows, which in turn reminded me of the following PBS video, A Murder of Crows, which details research at the University of Washington about how crows remember people's faces and teach their fellow crows about who is dangerous. Megan, this is wonderful. I remember and love that crow/kitten video. And I see from the picture that the babies are being instructed that YOU are the safe human to trust. Of course! Ah, yes. They are learning who is the soft touch in the neighborhood.